…as seen by ej flavors. 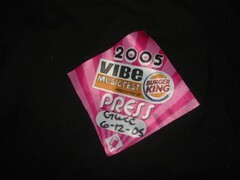 I had a very, very exhausting weekend working with the Vibe Music Fest which was in town. in Miami taking lots of photos, damn him! That in turn me think of…. 05 – Heavy D – Somebody For Me (big props to Nastybastard). the first cut I heard from Loose Ends this past weekend during their performance…. which is why I dropped…. and Dan. Cherrelle singing made me pull out…. 12 – Soul II Soul – Love Come Through, which reminded me of…..
Outsider and close it out with…. 15 – Loose Ends – Dial 999. Okay, you pulled out Chuckii Booker? Your crates go JUST a little too deep for me bruh. Chuckii Booker? Lawd, I haven’t heard from or seen that brother since he was the musical director for Janet Jackson’s Rhythm Nation Tour. Yes, some of us want a little Alex and you deliver! And a little Vanessa Williams! Thanks! man, you be pullin’ stuff out the crates. I totally forgot about Shanice. Aleese Simmons? Marvelous!!! Man! This is a nice mix! wait….why do I keep “rewinding” Alex O’Neil!!! Great Job!! ok the winner for me in this selection is ‘Portrait’. Man, I thought their initial cd was awesome! what happened to them?!?!?! I love “It’s for you”. Hearing that song just made my whole weekend :)! I’m jealous!!!! You met Loose Ends damn it! Oh my God!!! Why did you have me rocking last night around 3 AM when I thought I couldn’t push through to deadline without dropping dead?!? You just brought back my entire junior high/high school years! Do you ever burn CDs for loyal reader/listeners? If so, sign me up! If not, perhaps you could be pursuaded if I rave on enough about the unerasonable and insane love I have for your radio blog? Mmm, yes, i remember Chuckii’s lips. He wasnt funny lookin’ to me. He’s cute girl!!!! He could put them lips on me anyday!